How to Play Melodies by Ear with More the 5 Notes? How do you know which notes make up the melody? You knew to use the notes c,d, and e in your tutorial, but what if you don't know the notes of the melody, or what the chords are? Do you decide to play it in the key of C, because it's easierr, find the melody in this key, with the appropriate chord progression, and then change the key when you think you have the song? Hi, how can I learn to play melodies on piano by ear? I have written some lyrics and I have the chords in my left hand. Now I'd like to play the melody with my right hand. How shall I do it? How to fit chords to a melody? I wanted to learn how to match the melody notes to the appropriate chords. Chords that have a different note other than the note included in that chord. For example, if you have a C major chord that matches with F as a root note (CEG/F instead of CEG/C). 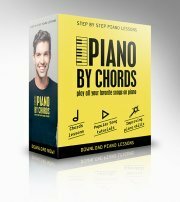 Looking for book--How To Play Piano by EAR! David, today I watched your video on "how to play piano by ear" and was totally amazed at how well you teach. I wish I lived close by, I would hire you for lessons. Anyway, can you recommend a book that deals with this subject and teaches it well? Maybe you have one. I've searched amazon.com, looked inside some of them but am at a loss. I sure hope you can help me. Maybe someone here on this forum knows of such a book. Please let me know. Thanks! I know about piano and I had completed my piano grade 8 in royal school of music. However, I think it's not sufficient. Well, like many I just play by reading music sheets. I wanted to learn to be able to play by ear. The melodic part is always easier but most of the time I just couldn't figure out the left hand accompaniment. If I had i play the piano with the common 3 tone chords accompaniment I feel it is rather boring. Many told me that I'm too old to train to play by ear. is it true? How do I create more varieties with the left hand accompaniment? I am a play by ear ever since I was a little. My parents sent me to PBE music class which I have completed only up to the first grade. I started playing songs without refering to sheets at all. I hear a particular song of my interest repeatedly and then I start playing. But sometimes I find it boredom using the same rhythm of chord, and also I find it difficult to read notes from the music sheet and play. I have been trained in such way that I hear and I play. I would like to ask for your help on this and how can I improve my left hand. I would really appreciate your guidance. Kudos - 'Three Chords and the truth' is a great article on what I think is the most important aspect of basic musicianship. However, it contains some mistakes that will confuse beginner students. In both 'Jingle Bells' and 'One Love' you're introducing the subdominant in bar 7 where the melody clearly asks for the tonic. Specifically, you're harmonizing an E melody note on the strong first beat with an F Major chord. Even in Jazz, you would avoid this. In 'Happy Birthday' you're introducing the dominant in bar 7 two beats early. The E and C melody notes on the first two beats are a 6th and a 4th when played against a G Major chord, which is harmonically weak. I don't think that works, does it? If a person has part of a songs music sheet. For example only the intro, 1st and some of the 2nd verse but it missing the chorus and other parts, is there a easy way to figure out the notes to the rest of the song? Hi, in your chord substitution, you said A minor is the parallel scale of C major. It should be Cminor is the parallel scale of C major and Aminor is the relative of C major , right? So i've already went through all of your chords classes which are by the way, very very helpful. I picked it all up in one night as a beginner so i'm kinda thankful. But i have no idea how to determine the Key of like A, B, C, D, E.
Or how to play inside those keys and determine the difference. I have been taking piano lesson for long time, I wont to learn more, I could read the sheet music with the chords in right hand , I'm having troblem with playing melodies in right hand I just cant figure out the melody. I know my chords an scales party much, I'm telling myself just can't do, that is my desire to play for the Lord, when I'm playing I'm counting in the measure my four beats with chords in right it don't sound right this meant not sound right. I need help right hand melodies.